The start of the 20th century saw the arrival of the Airbus A380 at Filton. The decade was marked by the repercussions for the attack on the World Trade Centre which has left UK and other Western allies engaged in a war against a terrorist enemy at home and abroad. The decade has also seen growing concern over the environmental impact of human activity particularly with regard to global warming. Partners in Airbus Industrie form Airbus SAS (BAE Systems holds 20 per cent). Concorde resumes transatlantic service after Paris crash. Hijacked aircraft crashed into the World Trade Centre and the Pentagon. War on Terror begins in Afghanistan. Space station Mir ends its 15-year mission. Concorde 216's final flight to Filton before becoming 'grounded' as a visitor attraction. Launch of Second Gulf War. Space shuttle Columbia disintegrates. Centenary of Wright brothers' first flight. First non-stop solo flight around world. BAE sells its 20 per cent stake in Airbus, leaving it wholly owned by EADS. Space Shuttle Discovery conducts two-week mission to International Space station. GKN buys Airbus' Filton wing-making facility. Maiden flight of Airbus 400M. 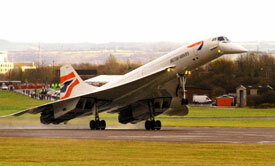 Concorde comes home (South Gloucestershire Council). 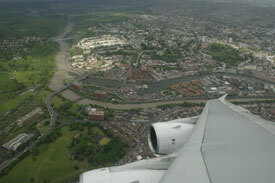 View of Clifton from A380 (Airbus). Step aboard Concorde 216 at Concorde at Filton. Search the Aviation Archive for images of West of England aircraft in the 2000s.